M.S.G., an amateur football referee was rounded up after his last match, as part of an investigation into the Gülen movement, which the government accuses of orchestrating the July 15 coup attempt, last week. 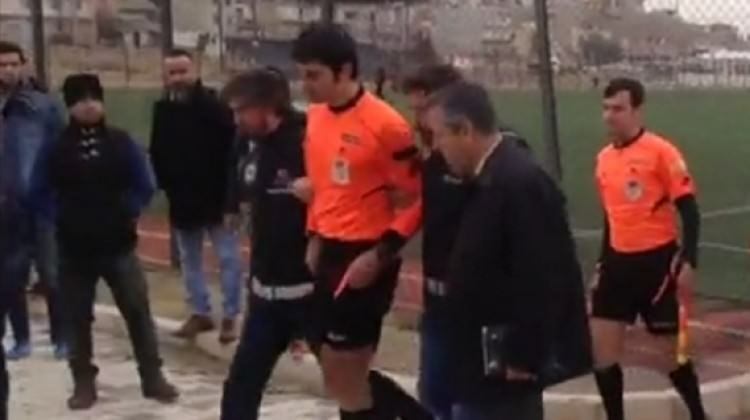 A university student and a referee at İzmir Regional Amateur League, M.S.G. took charge during a match between Asarlık Gençlikspor and Dikili Belediyespor, on Dec. 4. A group of police officers detained him immediately after the match. Turkey survived a military coup attempt on July 15 that killed over 240 people and wounded more than a thousand others. Immediately after the putsch, the Justice and Development Party (AK Party) government along with President Recep Tayyip Erdoğan pinned the blame on the Gülen movement, inspired by US-based Turkish Islamic scholar Fethullah Gülen. The movement denies the accusations. More than 120,000 people have been purged from state bodies, nearly 80,000 detained and some 40,000 arrested since the coup attempt. Arrestees include journalists, judges, prosecutors, police and military officers, academics, governors, football players and even a comedian. Earlier, former Galatasaray player Hakan Şükür’s father was arrested when the regime was unable to find the footballer as part of a separate investigation into the movement, in Turkey. Şükür’s father was released this week due to deteriorating health in prison. Meanwhile, an indictment seeking up to 15 years’ imprisonment for former Galatasaray soccer players İsmail Demiriz, Arif Erdem and Uğur Tütüneker over alleged links to the Gülen movement has been drafted, according to Turkish media on Thursday.